In the Los Martires neighborhood. Don’t turn the other cheek, ladies! All of our tours include street art, but we can also arrange private street art tours focusing on Bogotá’s great graffiti. Like other private tours, the tour can start at the time you like, lasts about four hours, and you choose the route in consultation with the guide. Street art tours can also include other things, such as fruit tasting, coffee and even tejo, depending on your interests! ‘The Treasure of the Savannah’ on Calle 26. Also like other private tours, street art tours can start either from our shop or from your hotel or apartment, for an additional charge for bicycle delivery. 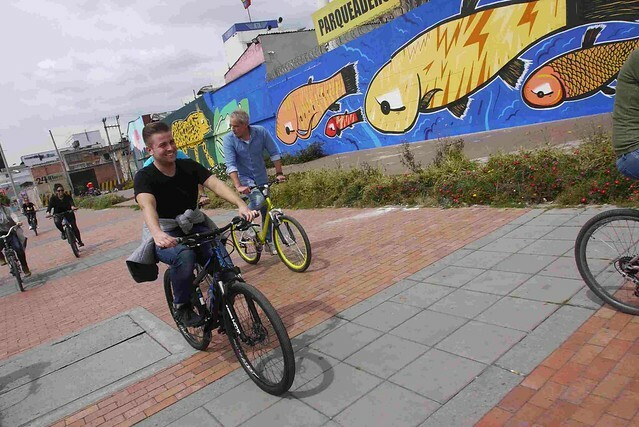 A private tour for two people costs 130,000 pesos for the two, including the guide, bicycles and helmets. Ask us for rates for larger groups. During recent years, Bogotá has seen an explosion of street art, much of it sponsored by City Hall. The city’s attitude toward street art turned more positive after an incident when a young artist was chased down and killed by police. A few years later, after a concert here, Justin Bieber and his buddies, escorted by police, painted a Canadian flag with the maple leaf replaced by a marijuana leaf. Bogotanos asked why police shot a Colombian artist but protected a foreigner. Click the photo above to see more of Bogotá’s great street art!